Beauty and the beast inspired jewelry, ring bracelet set, Kids birthday party favor, red rose bracelet, beaded bracelet. Set of TEN. Party planning is already so stressful. Leave the favors up to us! This listing is for (10) child sized bracelets. The length of a bracelet is 6.5" (we can make them smaller or bigger for you). If the bracelet does not match your party theme exactly, just send us a note. We love custom orders and will gladly work with you to change the colours or charms, to match your party theme. You may also check our Social Media pages, if you are looking for some more ideas for themes or charm choices. 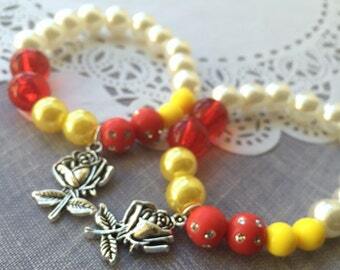 Beauty and the beast inspired, Kids birthday party favor, red rose bracelet, beaded bracelet, childrens bracelet. Set of TEN. SET of TEN, Beauty and the beast inspired, Kids birthday party favor, red rose bracelet, beaded bracelet, childrens bracelet. 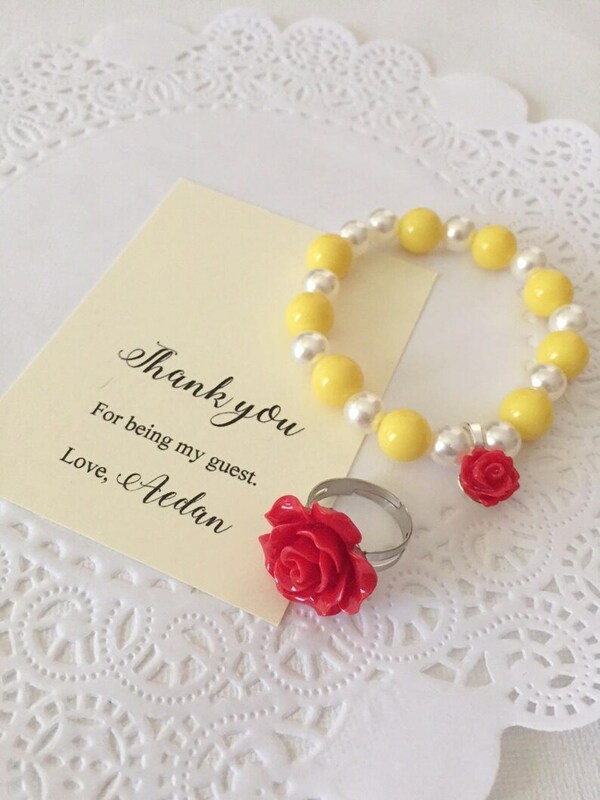 Kids birthday party favor, beauty and the beast inspired, rose charm, beaded bracelet, jewelry favor, childrens bracelet. Set of TEN. SET of TEN, Beauty and the beast inspired, Kids birthday party favor, beauty and the beast wedding, beaded bracelet, childrens bracelet. 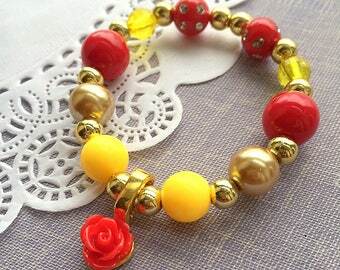 Kids birthday party favor, beauty and the beast inspired, kids beaded bracelet, rose charm, jewelry favor, childrens bracelet. Set of TEN. 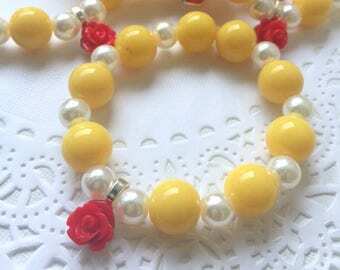 Kids birthday party favor, rose bracelet, beauty and the beast inspired, kids beaded bracelet, jewelry favor. Set of TEN. Beauty and the Beast inspired keychains, party favours, backpack clip, Kids birthday party favor, Set of TEN. 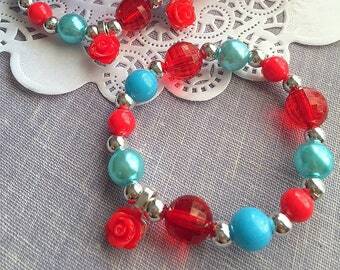 Princess kids birthday party, beaded bracelet favor, kids bracelet favor, kids jewelry, red rose bracelet, elena of avalon. Set of TEN. I bought these as gifts for my daughters 4th birthday party, the girls loved them! Thank you! Flower girl proposal ring, ask Flower girl, rose ring, rose jewelry. Omg I cannot describe how much I love them & how cute they are! The price was amazing, they got here so fast, & the quality is great! Thank you sooooo much for the amazing ring and necklace/earrings set! I love it soo sooo much! Flower girl gifts, small sized rose necklace, earrings, personalized notecards, free jewelry box. Ask Flower girl proposal ring, ask Flower girl, rose ring, rose jewelry. Party, kids, children, stretchy, bracelet, jewelry favor, princess, crown, tiara. Set of TEN. Personalized bracelet, name bracelet, Set of TEN. Kids birthday party favor, unique name bracelet, kids jewelry, kids bracelet, beaded. Wizard of Oz inspired, kids birthday party, beaded bracelet favor, jewelry favor. Set of TEN. Kids mermaid scale bracelet, mermaid party, mermaid loot bag favor, beaded bracelet, mermaid bracelet, mermaid jewelry. SET of TEN (mixed). Personalized bracelet, name bracelet, ONE bracelet, unique name bracelet, kids jewelry, kids bracelet, beaded, birthday party gift. 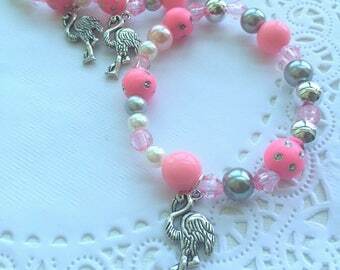 Flamingo party, flamingo bracelet, flamingo jewelry, birthday favor, kids jewelry, beaded bracelet, SET of TEN. 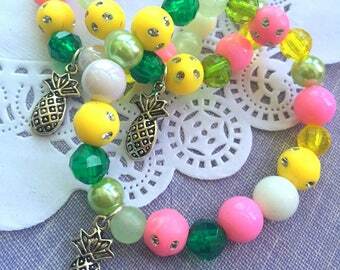 Pineapple party, pineapple bracelet, kids jewelry, pineapple birthday favor, beaded bracelet, kids birthday favor. SET of TEN.